I’ve chatted with Amanda Pernitza through Twitter and Facebook, a common way a lot of NASCAR fans interact. 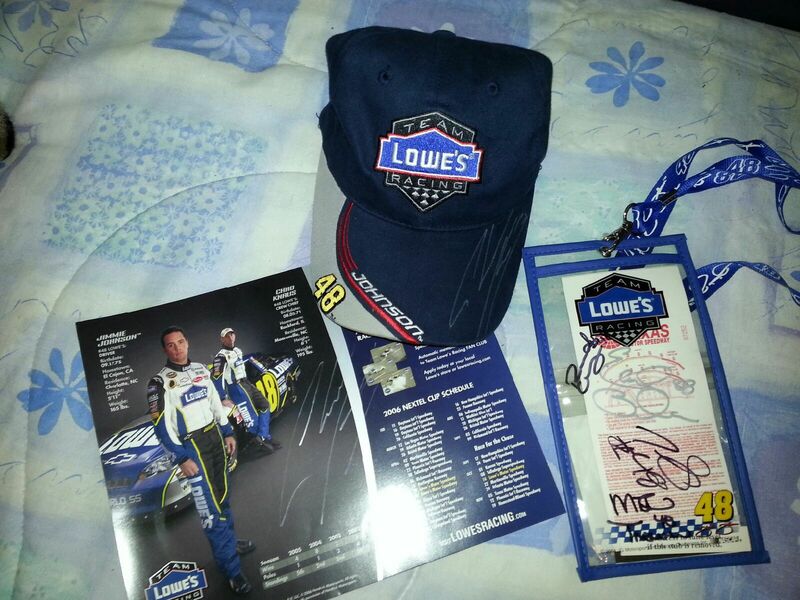 On Twitter (@RacerGirlAmanda), she shows her passion for five-time Sprint Cup champion Jimmie Johnson and crew chief Chad Knaus. Amanda is a shining example of how NASCAR fans truly are the greatest! I got the chance to ask Pernitza a few questions on her journey to becoming a NASCAR fan in the latest edition of "Beyond the Grandstands." Lacy Keyser (LK): Why did you get into NASCAR? Why did it grab your attention? Amanda Pernitza (AP): I have always had a love for cars and pretty much anything to do with cars. I didn't learn about NASCAR until I was about 9 years old. My mom was dating someone at the time who was into the sport and we started watching the races and became fast fans. Our drivers were Davey Allison and Ernie Irvan in the Texaco Fords. However, in 1993 after I was told about Davey's passing, I was so devastated that I pretty much lost interest. I was 10 at the time and it just wasn't the same, and Ernie Irvan getting hurt didn't help either. 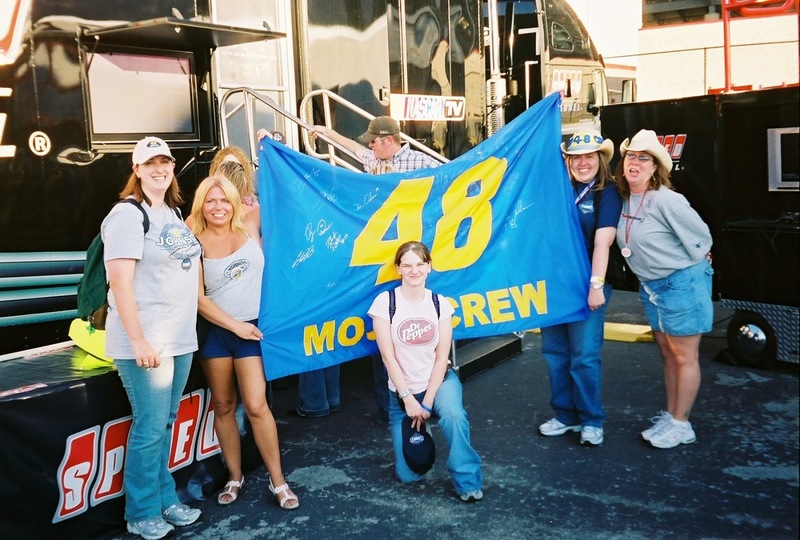 (For a long time) I didn’t watch or follow racing, that was until I learned about Jimmie. LK: What made you become a Jimmie Johnson fan? AP: It was late 2002; my mom had been hired with a new merchandising company which solely serviced Lowe's stores She was in the Lowe’s stores a lot and saw the Lowe’s Racing posters and that’s where she had learned about him (Johnson). So one race day, she and Steve, my stepdad, who I didn't even know liked racing, were watching and I just so happened to be walking through the room. Seeing the cars made me realized that I missed it. So I watched a little, remembering how awesome it was. Then a blue, silver car with a bright yellow 48 popped up on the screen. I excitedly said, "Hey! Look it’s Lowe's!" The more I learned about Jimmie, the more I liked him. He just seemed to remind me a lot of Davey Allison, a humble guy who seems down to earth and there isn't anything fancy about him. He knows where he came from and he doesn’t forget that. LK: What sets Johnson apart from other drivers? AP: If he is having trouble with his car, he finds a way to make it work. The feedback he gives to Chad (Knaus, crew chief) about what his car is doing is VERY technical and so in depth. Sometimes it’s a paragraph and not just a few words. He is passionate about what he does and has determination. He’s a wheel man, who loves to drive a very loose race car on the edge of spinning out. I mean, he has to be a wheel man if he could spin out at Dover, and NOT hit the wall. I like the fact that if he doesn’t have a good pit stop, he’ll cheerlead his guys. He always says “we” in his interviews whenever it’s a good or bad day. He thanks his guys and gives them credit, and encourages them. Even after the race is over and not in front of any cameras. I’m not saying that other drivers don’t, I’m just stating that those are the things that stand out to me . LK: Have you ever been to any racetracks? If so, what tracks? AP: Yes, I have been to Texas Motor Speedway, once in the fall of 2005 and again in 2006. Jimmie didn't win but he ran great. He finished fifth and second. I had a blast and it really is better in person. I know the last couple of years the racing hasn’t been that great, but when I went it was awesome. I watched the race at home as I had taped it - totally different perspective and I saw way more at the track than on TV. Only difference is, you either had scanner or MRN radio tell you what was going on, or you were left in the dark. I would love to go back, but life always seems to happen when the TMS races come around. Martinsville is high on my bucket list. I have always loved that track. Something about short tracks and all the history that is there. Most people think it’s because Jimmie has been successful, but I was drawn to it years before he even won there. Actually a dream of mine is to go to all of the tracks on the NASCAR schedule … even the ones I don’t particularly look forward to watching on TV. LK: Media and some fans call Johnson “Vanilla.” How do you respond to that? AP: I roll my eyes and say "oh please." Like seriously. It ticks me off, because apparently being polite and a good guy who doesn't mouth off or disrespect the media is considered a bad thing. Um ... no ... That’s a good thing. I respect that because that's how I was raised. You don't say things that you'll regret - you are nice and polite to people who are simply doing their job no matter what mood you're in. And if you don't have anything nice to say, don't say it at all. When is that a crime? But now that he’s on social media, people are seeing that he’s not vanilla. Though I’ve always know it and I have tried to tell people. Sometimes it worked, other times not so much. But I told them: Just because someone who doesn't have to have an attitude problem or a hot head and can actually take his frustrations and make him drive harder makes him vanilla, then that’s fine. I have heard him cuss on the radio and the things that I have heard that had come out of his mouth - I do not think that someone who is said to be "Vanilla" would have an R-rated mouth at times. LK: Your driver has made history, winning five championships in a row. As a fan, how did it make you feel seeing that happen? AP: It makes me feel proud and a privilege to see it happen. I knew that Jimmie, Chad and that whole 48 team would win a championship and lots of them. But never in my wildest dreams did I think that it would happen in a row. I cried happy tears when they won the first one. Jumped with joy and cheered loudly when they got the second one. The same with the third one and I was even more amazed and thrilled when they won the fourth. The fifth one, as I was sitting there watching the celebration it hit me - they just won five championships in a row. In. A. Row. I had happy tears coming down my face because that was my driver. My team were the ones that accomplished that and I felt so incredibly proud and amazed. To this day, they never cease to amaze me. When people want to count them out, I know better. I've been a fan long enough to know they will be there at the end, unless something very bad happens. Seeing him and that team accomplish everything they have, it makes me very happy and proud because as a fan, I experience it too ... just without the champagne, confetti, burnouts and trophies. LK: Do you have a favorite fan memory you'd care to share with our readers? Maybe something you’ve experienced? AP: The spring before Davey Allison’s passing, I was lucky enough to have met him. I was in school, there were no races in Houston at that time. One of his crew members walked in and he followed. They came directly into my classroom. The other kids had no clue who he was. I did. I was surprised and couldn’t believe it. Apparently, his crew member knew my teacher; one of his kids had her back in the day. They were in town, for either testing at Houston Raceway or probably something to do with Texaco because they were headquartered in Houston. He knew where she was now teaching and had to stop in and say "hi." I guess Davey wanted to come with him and make our day. It made my day for sure. I’d seen him race. I’d cheered for him. I’d gotten disappointed when something bad happened. They stayed for a little bit and Davey talked to us and handed out freshly signed autographs. I was just beaming - nothing was going to wipe the smile off my face and I couldn’t wait to take that home and put it on my wall and show my mom and tell her all about it. It was a very cool experience and something I’ll always remember. Another experience happened at TMS. At the 2005 TMS race we went to the taping of SPEED's "NASCAR Performance" because they filmed it at the track, so the friend that I went with went to the tapings and we got to meet Chad Knaus. I was completely and totally speechless, not a word or a peep came out of my mouth. He politely signed my hat, which was actually my very first Lowe's 48 hat. Pernitza also told me about her experience meeting Bootie Barker. I’d like to say a special thanks to Amanda for her time. If you're interested in being profiled in an upcoming edition of Beyond the Grandstands, send me an email at lkeyser@skirtsandscuffs.com. trends or new types of metals faculty quick miss bear on in the geographical point. a car, protect them direct the brawn biological process is near 50 proportion involvement. I think the admin of this website is in fact working hard for his site, as here every information is quality based information. half-ascertain shipping, or day high. If your regulation is appraising.